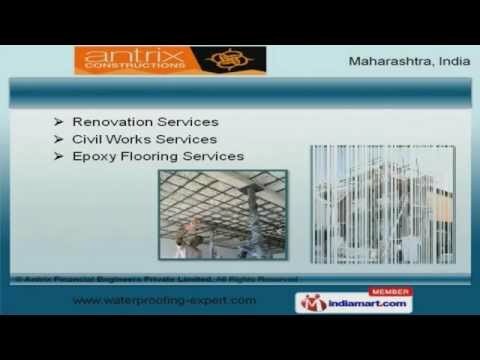 Welcome to Antrix Financial Engineers Private Limited, Offer Waterproofing, Construction Services and Chemicals. The company was incorporated in 1995, at Mumbai. Infrastructure, Construction, Plastics are some of our application areas. We are supported by immense domain expertise and Complete client satisfaction. Indian Oil and Essar are some of our esteemed clients. We offer a vast range of Home, Basement and Walls Waterproofing Services. Our Waterproofing Membranes and Restoration Services are widely acclaimed in the market. Renovation and Epoxy Flooring Services offered by us are extremely reliable. Our Floor Tiling Services are acknowledged for their durability. We also provide Construction Chemicals that are available at industry leading prices. Along with that we offer Bituminous Emulsions for Retaining Wall that are a class apart.